First visit, I spoke very quickly and asked many questions. All too often doctors respond to that with apathy and reluctance. 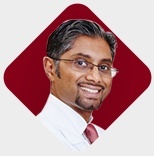 Dr. Chacko is an extremely patient, competent, attentive and sympathetic doctor. I got one epidural shot for my lower back and so far so good! The office staff are very friendly and efficient as well I'm glad I found him and you will be too! An amazing pain management doctor who has provided great medical service. He has been treating numerous injuries of mine over the years, and I have been extremely satisfied with the service. Always courteous..polite..friendly and helpful..have had injections..almost no pain..done smoothly..really a good doctor..with a good staff..very happy I chose to go here. I can’t say enough wonderful things about Dr. Chacko and his amazing staff at both locations. The staff is accommodating, compassionate & attentive and so incredibly pleasant to work with. Dr. Chacko is a wonderful dr with great bedside manner, he is very attentive to your issues and genuinely wants to help, this has become incredibly rare to find in a doctor in any field these days. I was extremely miserable and I went to 4 doctors before seeing Dr. Chacko and they were so disinterested in helping me I couldn’t even get someone to send me for an MRI to attempt to figure out what might be wrong. I am so grateful for this practice and how they have done and continue to do everything they can to help improve my quality of life. I make a bit of a drive to either office but it’s completely worth it! Dr. Chacko and his staff by far are the best. Dr. Chacko is very attentive and friendly. his staff are very professional. I highly recommend him to anyone who are in pain. I am so glad that my wife, Remedios Ibrahim, is one of his patient, and found the GOOD DOCTOR.